W & C Glazing is a family business which was established over 30 years ago by Billy & Celia Magill. The day to day running is now in the hands of their son Peter and daughter Lisa. W & C Glazing was established originally to service the domestic glazing market, however over the years we have diversified into Commercial glazing and Curtain Walling. 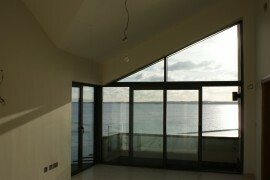 The team at W & C Glazing turn clients dreams into reality. We work closely with clients and Architects and would be involved in the design, fabrication and installation of Aluminium Curtain Walling, Windows and Doors and also PVC. We would be involved in new builds, renovations, extensions etc, and also can provide glass for general maintenance around homes, offices etc. W & C Glazing have worked on many projects including Comber Mill Village, Western and South Eastern Education and Library Board along with numerous Architects, Construction Companies and Retail Outlets. We have worked alongside many major contractors throughout Northern Ireland such as McCombe Bros, H & J Martins, Graham FM etc. W & C Glazing pride themselves on providing a friendly but professional service, and are interested in quoting for jobs both big and small.